Cherry's was founded on June 13, 1929 by my grandfather, Earl P. Cherry. Locating in the small town of Geneseo, Illinois, our first location housed a service station and lunch counter as well as a fishing tackle and gun shop. Despite the tough times of the depression and World War II, my grandfather spent a tremendous amount of time and effort making his dream come true. Customer lounge area with the steps to our second floor offices. The fancy brick facade with displays is to the right. Following World War II and his discharge from the Marine Corps, my father, Robert E.P. Cherry, rejoined my grandfather in the family business. By that time, the lunch counter portion of the business had waned and my father succeeded in talking my grandfather into dedicating the entire store to sporting goods. My father anticipated the strong demand for leisure activities that followed the depression and war years. 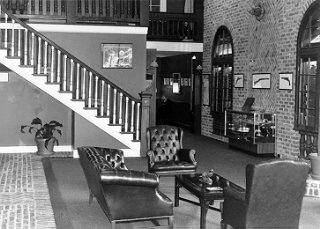 Along with a raw fur buying business they started together in the 1930's, Earl and Robert Cherry expanded the business greatly in sporting goods, eventually adding marine merchandise to the mix. Earl P. Cherry died in 1950 and my father took over sole management of the company. Between 1950 and 1961 Robert Cherry expanded the business very aggressively. Here is another view of the fancy brick facade that we have modified into display areas. 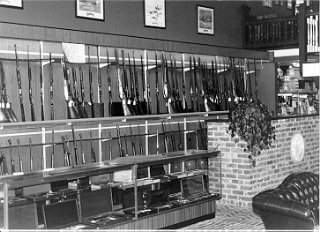 We have over 40 feet of long gun display area with room for over 300 pieces. 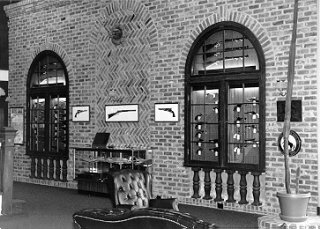 My father aggressively pursued this new gun collecting phenomenon, growing Cherry's into the worlds largest commemorative gun dealer and placing it in the international firearms spotlight. In 1965 Robert Cherry was named to the first Colt Commemorative Committee. Through the years he also served in similar capacities with Winchester, High Standard, Harrington & Richardson and others. 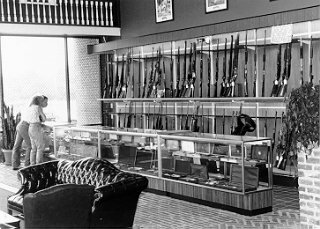 Among his many honors, my father was named the #1 Firearms Retailer in America in 1969 at an industry awards reception held in Houston, Texas. 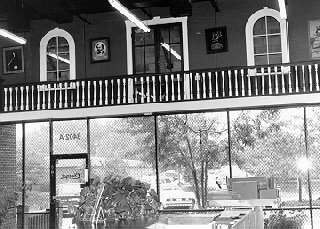 During this period, dad continued to expand the business, building a new, larger retail store. Robert Cherry was further honored in 1992 with his induction into the National Sporting Goods Hall of Fame, one of only 14 retailers to be so honored since the Hall's inception in 1951. Since 1961, many members of the Cherry family were involved in the company. I started working for my father during the summer of 1961, when I was 11 years old. I did odd jobs ... mostly the jobs no one else wanted to do. My brother Tol started in 1963, assuming the same duties that I already had. We both worked for my dad part-time all the way thru high school and college. After completing college, I assumed the roll of financial officer while Tol took over the marketing and advertising. My oldest sister Kelly also worked part-time for the company for several years before she moved to Denver, Colorado to attend college and eventually settle there permanently. Another shot of the balcony looking out the front of the store. My older sister Chris also spent several years with us before she returned to her first love which was teaching foreign language. She now resides in Nashville, Tennessee. Like many small town retailers, Cherry's eventually fell victim to the effects of the large discount chain stores. As their importance grew, many of our sporting goods departments became unprofitable and were discontinued. Eventually, there was no longer enough income generated to support all the families. Tol eventually left the company and moved to Phoenix, Arizona where he continues to be involved in the gun business. At the end of 1981, after serving the walk-in customer for 53 years, Cherry's closed the retail store to focus exclusively on the expanding mail order segment of the business. 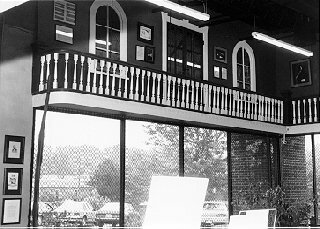 Cherry's operated a mail order business with a complete showroom from 1981 through 1985. In 1985, my father retired, and the business was sold to a parent company and moved to Greensboro, North Carolina. I stepped into my father's role as President of Cherry's and ran the business from 1985 to 1987. At that time, it became clear that the parent company's philosophy of business was not compatible with the philosophy that Cherry's had operated under for the previous 58 years. Following a lot of legal haggling, the business was later sold back to me. 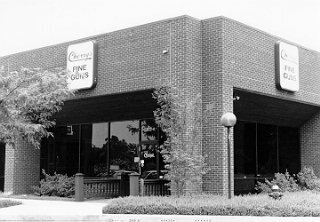 Along with the support of several European associates, the "new" Cherry's was "re-opened" in August of 1989 at our present location. Another shot of the long gun display area and sales counter. 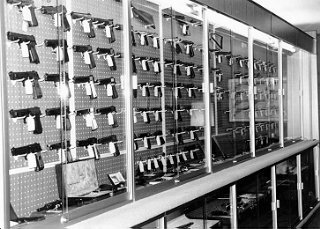 Our twenty foot, stand-up display has room for hundreds of discontinued and used handguns. to offer a good product at a fair price. We strive to find the best and most desirable firearms and then advertise them accurately, without over-describing their assets. This, combined with our liberal return policy, has given us a fine niche in the marketplace from which we hope to prosper for another 79 years.